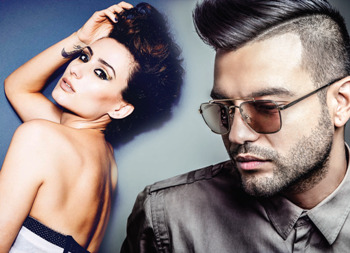 Sydney powerhouse vocalist and songwriter Diana Rouvas and Latin/R&B/Pop-singer/ songwriter/producer C MAJOR team up for a "Summer Acoustic Sessions" tour from December 2014 through to March 2015. Both artists respectively in 2012 and 2014 blew away audiences with their performances on "The Voice" garnering them a legion of new followers to their already established large fan-base. See them at Lizotte's Dee Why, Friday 16. Book Now. The "Summer Acoustic Sessions" will feature songs Diana and C Major performed on The Voice. For Diana such as 'Love On Top' (Beyonce), 'I Can't Make You Love Me' (Bonnie Raitt/Adele), 'Stormy Monday' (BB King/Eva Cassidy), her debut single 'Heart Of Goodbye', songs from the debut EP 'Never Say Hello', 'Your Woman' and 'Run' plus songs from the likes of Etta James, Mariah Carey, Joni Mitchell and new and unreleased tracks from her forthcoming album. For C Major on Ricky Martin's team, performances such as "Crazy In Love" (Beyonce), "Blurred Lines" (Robin Thicke), "Sing" (Ed Sheeran), and "Senorita" (Justin Timberlake) plus classic such as "Happy" (Pharrell Williams), "Treasure" (Bruno Mars) and "All Of Me" (John Legend). Also new songs from his debut album "I AM MAJOR". In a 2 hour show (2 x 55 min sets) featuring both artists and acoustic accompaniments, DiANA and C Major will bring the audience to a stand-still with their mesmerising vocals and all round classy talent.